The highest award given by a council. to promote and complete helpful projects for the betterment of Scouting. The Silver Beaver Award is one of the more prestigious awards made by the Boy Scouts of America. The award is presented by the National Boy Scouts and is the highest award that a local council can bestow on a volunteer for rendering outstanding service to Scout Youth. 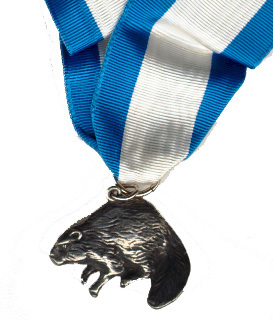 Established in 1931, the Silver Beaver Award is presented for distinguished service benifittinig youth within a BSA local council. More than 50,000 recognitions have been conferred to date. Use the Nomination Form to nominate an adult volunteer who you believe has rendered outstanding service. Submit the completed form to your local district leadership for review. This is the National BSA nomination form and replaces the previous council-specific form.